What better way to start a weekend breakfast off than with fresh scones? I've always favored scones as a classy breakfast pastry that can be prepared in under an hour (great for when you feel lazy!). What I look for in a scone is a stand-alone pastry that doesn't need butter and jam. This means they have to be sweeter than a biscuit -- really, do you want to be eating a scone and think, "Hey, these would go great with a bowl of chili!" No. So I tend to favor scones that are on the sweeter side. 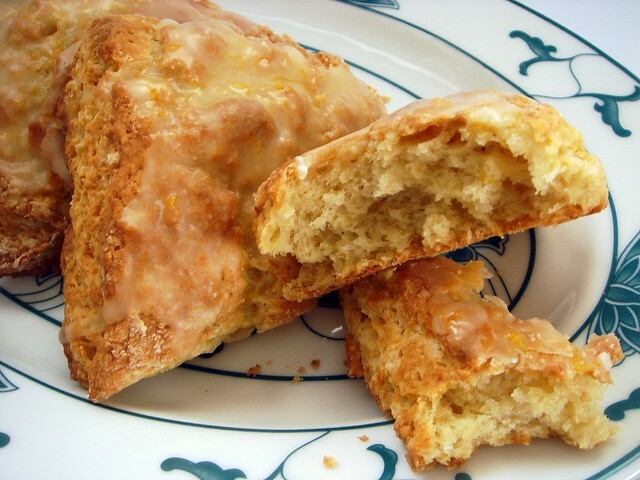 A glaze is optional as long as it enhances the scone without taking it from pleasantly sweet to tooth-aching. A quick bread means all the dry ingredients are mixed together before the liquid is added. The butter is cut into the flour mixture, helping the scone develop its flaky texture. I grated the butter and placed it in the freezer as I prepped the remaining ingredients. Since the original recipe called for cream and not buttermilk, I replaced a 1/2 teaspoon baking powder with baking soda to help with the acidity. Also, I didn't have buttermilk. Instead of souring milk with a tablespoon of vinegar, which I find has a thinner consistency than buttermilk, I used a yogurt-milk mixture. It's made up of a 2:1 ratio of yogurt to milk, so 1/2 cup yogurt and 1/4 cup whole milk. This makes an excellent substitute for buttermilk. Edited to add: I've since been using a 1:1 ratio of yogurt to milk and find that it's not quite as thick as the 2:1 ratio but works just as well. 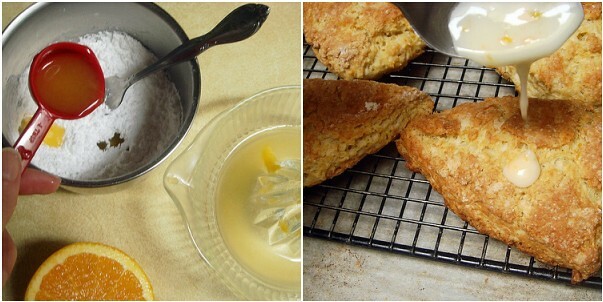 Use a light hand when mixing any type of quick bread, and especially biscuits and scones. Over-mixing over-develops the gluten and produces a tough pastry. Mix just until a dough comes together, then turn out on a lightly floured surface to pat down. 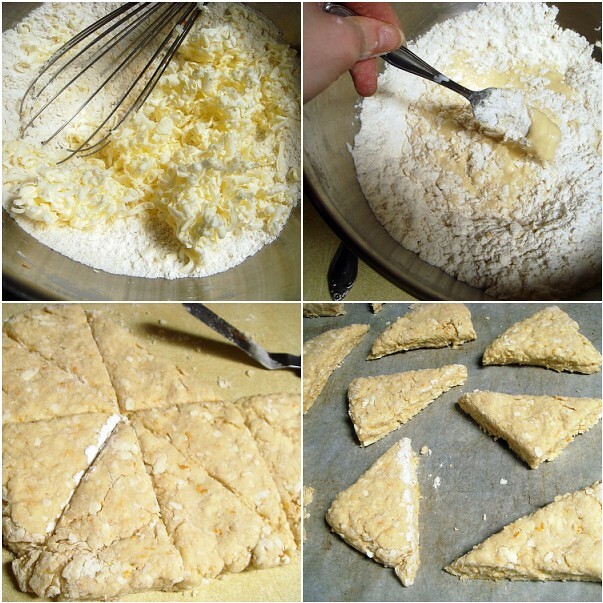 I patted the dough into a rectangle instead of a circle and cut 12 scones instead of 8. The glaze is just a mixture of confectioners' sugar, freshly squeezed orange juice, and a pinch of salt. This didn't a thick icing, so if you want it thicker just add more sugar. These scones baked up into a one of the best I've ever made. The texture was light, fluffy and flaky, and the outside had a nice crunch. The orange flavor came through wonderfully and was enhanced by the glaze. I liked the bright flavor. These would be perfect as miniature scones for a brunch or breakfast party. The changes I made to the original recipe were to add the orange zest to the flour mixture. When mixed together, this helps the zest release oils, giving the scone more flavor. Since I opted to make 4 more scones than the original recipe, I had to pat the dough out a bit more, making the scones smaller in height than what they would have been. You could try patting out to 1 1/2 inches (a square, not a circle) and simply slice more than eight scones, but I didn't go for that. Otherwise, the height would have been incredible. Other than the glaze, I didn't differ much from the recipe except using buttermilk over cream. Preheat oven to 400°. Line a large baking sheet with parchment paper. Whisk flour, sugar, orange zest, baking powder and soda, and salt together in a large bowl. Cut in grated butter until mixture resembles wet sand. In a small bowl, whisk together buttermilk, eggs, and vanilla extract. Add to flour mixture and mix just until combined. Turn out onto a lightly floured surface and pat into a 1/2 inch rectangle. Cut out 12 triangles and transfer to prepared baking sheet. Bake for 20 minutes or until the scones are a delectable golden brown. While the scones bake, prepare the glaze. Mix confectioners' sugar, orange juice, and salt together to form a glaze. If you prefer a thicker consistency, add 1/2 cup more sugar and 1/2 a tablespoon to a tablespoon of extra juice. Remove from oven and place baking sheet on a cooling rack. Let scones cool for 3 minutes before glazing. Put scones on cooling rack and place the rack on top of the baking sheet. This will help catch the glaze that drips down and minimizes a mess. Portion glaze out evenly amongst scones and spread with the back of a spoon. Serve with tea and enjoy. i love scones... i'll definitely be trying these! 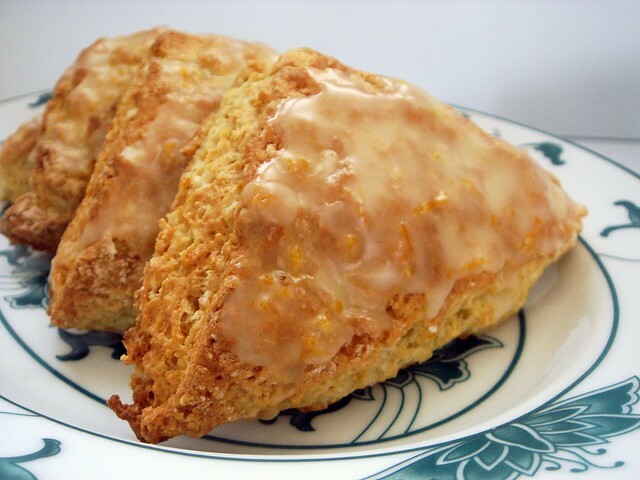 ooh we love scones in our house and orange is a flavor I've never tried! Gorgeous scones! They look so flaky and delicate. I think I would have gone with the buttermilk/soured milk instead of cream, too. I love the flavor of buttermilk. Excellent work! PajamaChef - Happy baking! Scones are the best. Natalie - Give it a try. It's a nice citrus change from lemon. 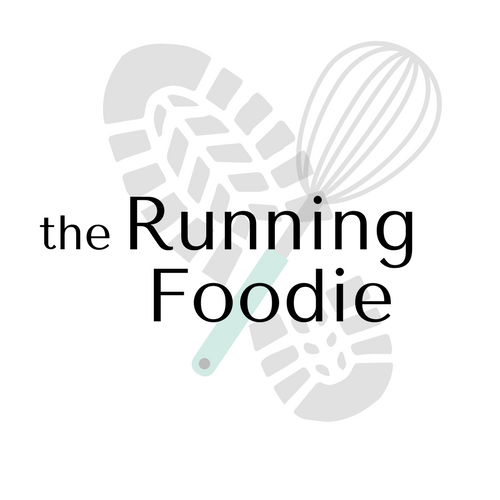 MickiRuns - Get the pretzel maker to bake some up! Jean - I agree. I'm not sure exactly what the cream lends the scones except for a richer flavor. In that case, I think buttermilk usually tastes better. My favorite cake recipe uses buttermilk. i'm loving all things orange these days, so this sounds perfect!! I love scones. These look absolutely splendid and delightful! 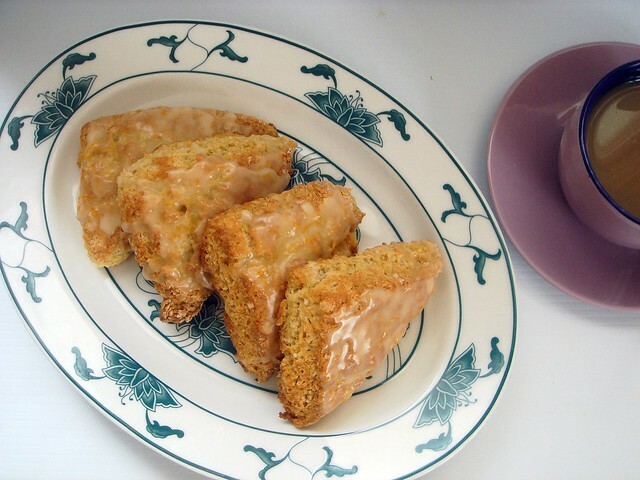 Hi Christina, just found our blog through Foodieblogroll and thought the orange scones looked so good that I wanted to grab them off the screen. For a happy little surprise, try adding just a few mini chocolate chips. Different! 31 flavors used to have an orange-chocolate ice cream called Mandarin Chocolate ... reminds me of this. I love the chocolate-orange combination. I don't often think of putting it in breakfast baked goods, but it won't hurt me any to do it! I made these last weekend and they were SUBLIME! Thanks for sharing!